Airport securityNapolitano says Israeli-style security is not suitable for U.S.
Fox News reports that critics of U.S. security methods, particularly full body scans and the so-called “invasive pat down” used by the Transportation Security Administration (TSA), have called for American airports to adopt Israeli-style security measures, which rely heavily on behavioral profiling of travelers. Napolitano said, however, that what is effective in Israel, a nation of 7.3 million, would not necessarily work for 310 million Americans. Ben-Gurion is Israel’s only major international airport. The United States, however, has 450 such facilities. Plus, about eleven million people pass through Israeli airports each year, while seventy times that many passengers go through American airports each year. “So there’s a very big difference in terms of size and scale,” said Napolitano, who granted Fox News exclusive access to join her on a week-long, security-focused trip to Europe and the Middle East. Early Tuesday, the head of security at Ben-Gurion gave Napolitano a tour of his airport’s system and a “comprehensive briefing” on Israeli airport security that “covered the spectrum from intelligence to the perimeter security of the airport to checkpoint screening and everything in between,” according to a Homeland Security official. 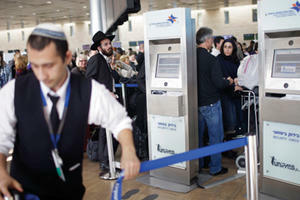 Ben-Gurion has formidable security measures apparent even to an outsider. Snipers stand watch from a glass-encased booth suspended above the airport’s main entrance, visible from a traveler’s first steps into the airport. In the run-up to the Thanksgiving holiday, the Transportation Security Administration began to come under fire for its enhanced security measures at. In the midst of the firestorm, Representative John Mica (R-Florida), and others called for TSA to adopt Israel’s style of screening. Napolitano and TSA chief John Pistole have said repeatedly that the new procedures at U.S. airports are so far the best way to keep ahead of the “evolving threat.” A department statement issued late Tuesday noted that the TSA uses a “layered security approach,” including the deployment of behavior detection officers, air marshals and explosives detection canine teams. Overseas terrorists have repeatedly targeted U.S.-bound flights. On Christmas Day 2009, Umar Abdulmutallab of Nigeria tried to detonate his explosives-laden underwear over Detroit. In October, two packages containing explosives were sent from Yemen to the United States, but they were intercepted overseas after Saudi intelligence officials shared information about the plot. Both attempts have been tied to Yemen-based al Qaeda in the Arabian Peninsula. During Napolitano’s private briefing with Israeli officials at Ben-Gurion, they discussed cargo screening and how to stop non-metallic explosives, such as those used in the recent plots, from getting onto a plane, a Homeland Security official said. Despite repeated attempts to speak with an Israeli official about using their security model in the United States, the Israeli government declined to talk with Fox News, citing an aversion to discussing their security measures publicly.